Now this is definitely not something that you see every single day – a charging cable that comes with its very own integrated battery? That sounds right out of this world, and at the same time, many folks might wonder how come they have never thought of coming up with this particular idea before, considering the amount of sense that it makes. 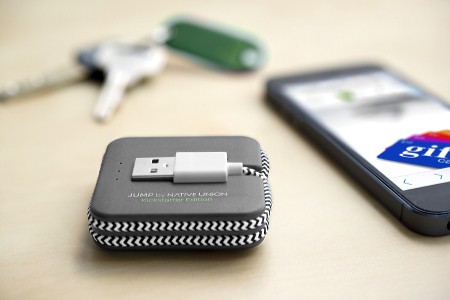 The folks over at BiteMyApple.co have just announced the availability of JUMP, where JUMP happens to be a charging cable that has a built-in 800mAh battery which will not only charge your smartphone, but syncs with it as well. Native Union have specially designed this particular tiny, lightweight charger in order to have it provide your smartphone with an extra boost, and not only that, it also does away with the need for JUMP’s owner to juice up the device. Considering how JUMP tips the scales at less than a couple of AA batteries, you know for sure that road warriors as well as frequent travelers would not mind bringing JUMP about with them wherever they go, be it on a business trip, a vacation, or simply to run errands. This particularly compact cable will be able to fit easily in the coin pocket or behind the phone even as you continue to make phone calls, thanks to its precision-engineered channels which will securely fasten the cables. It will sport cables that were designed from hard-wearing resistant nylon to deliver durable and long-lasting usage, while JUMP’s thermoplastic blend of PC and ABS ensures strength and longevity. Expect this tangle-free nylon cable to serve you for years on end, and interested parties can pick JUMP up for $49.99 a pop.